Seems like Chuck and I always fish on the same day. Got to the river by 11am. Chilly 48F water temp with vis 2.5'. Had white clatter-B in tow. Got a 14 on the inside of the seem, then a nice fish almost hit 18" on the outside. Nearly swallowed the bait. Hungry. 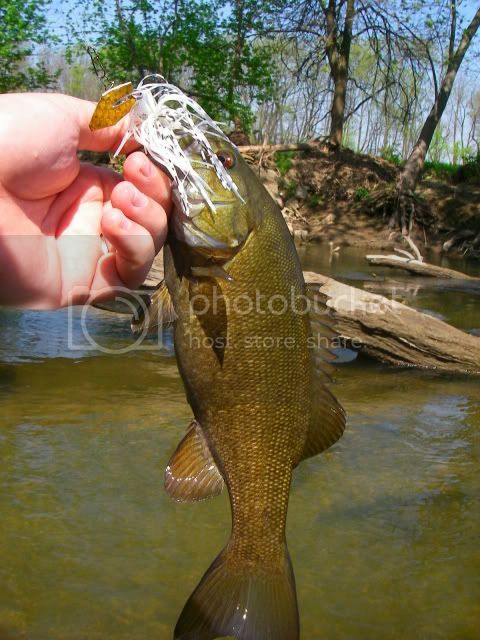 Every likely spot produced, and I had 11 Smallies 2 hours in, most in the 12-14" range with the one nice fish. 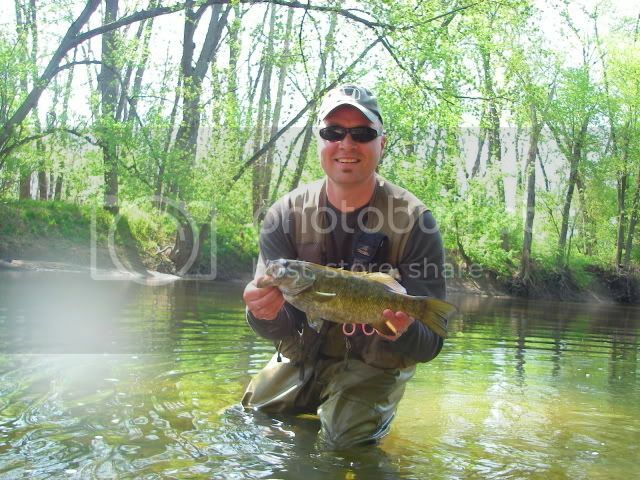 Here's a pic of a smallie I took a picture of because it appeared a purple brown, by the time I snapped him, he had already started to change. The sun came out and the fishing stopped, or rather the aggression towards the chatter stopped. Water was clear and fish were scattering ahead of me. I finally threw on Sammytime just to check. After a few casts, I got some playfull slaps at the lure. 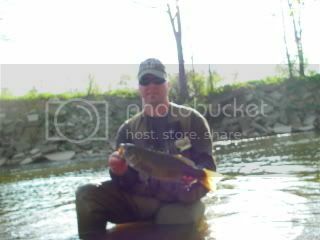 Then I got a smallie and couple of greenies. I only got bit on long casts. Fish were ultra spooky. Experience tells me when the water is that clear and low Sammy is the lure to throw. Despite Sammy making things interesting, the chatter still wasn't getting bit. I passed a hole with at least 100 carp of all sizes in it, they were jumping and frolicking. Maybe spawn? Stunk because it's normally a good smallie hole. Kid came running up wanting to fish my hole when he saw me catch the big one. I told him he could cast but to stay back as not to spook the bass. Turned and walked back home throwing Sammy downstream as I walked back. Had the first huge blowup of the year produce a fat 16" and 4 more on the walk homewards. Today was a tale of the two ends with not much in the middle. Kind of surprised of the size today, saw some fish near beds and left them. Broke down as 12 on Chatter-B, 5 tube, 9 Sammy.